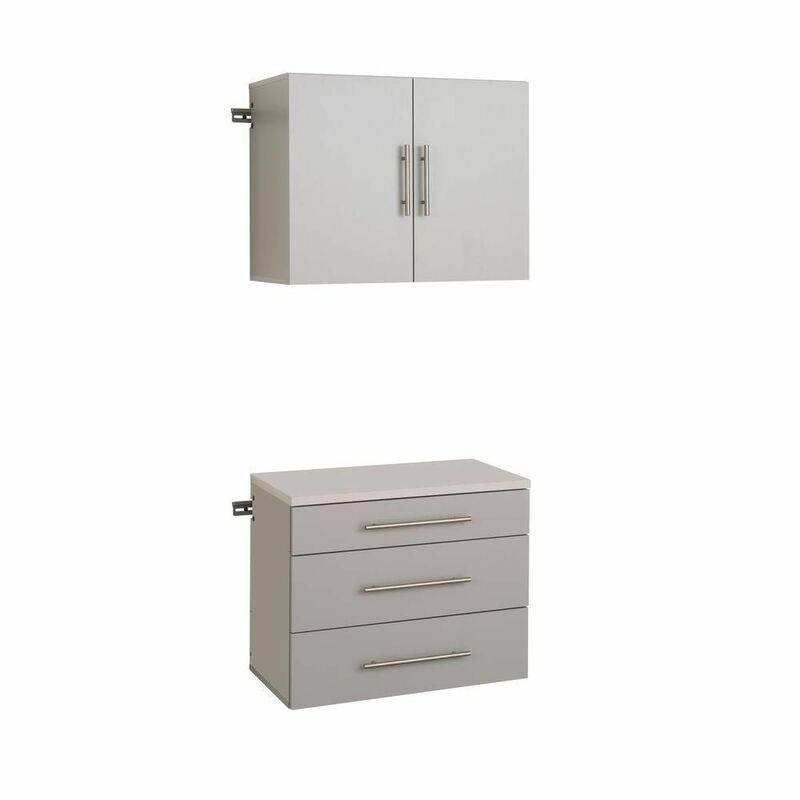 HangUps 30 Inch Storage Cabinet Set A - 2-Piece The HangUps Storage Cabinet Collection offers versatility for your ever changing storage needs in the garage, laundry room, office or workshop. The Cabinets mount securely to the wall with a heavy duty metal rail and hook system. The wall mounted feature ensures easy cleaning beneath the cabinets and protects your stored items from water and dirt. The HangUps Collection is constructed using laminated composite wood and features metal handles and adjustable hinges. This product ships ready-to-assemble and includes all hanging rails and fastening bolts. HangUps 30 Inch Storage Cabinet Set A - 2-Piece is rated 4.0 out of 5 by 1. Rated 4 out of 5 by OrganizationTeam from Easy to assemble and install - surprisingly solid cabinets for the price and they look great. On... Easy to assemble and install - surprisingly solid cabinets for the price and they look great. Only reason I did not give a 5-star rating is because I had to trim the pre-cut center piece that supports the base cabinet to the track in order for it to fit correctly. Had I not had a chop saw I would have been a very unhappy girl because doing it by hand would have been a pain. Thanks for a great product otherwise! Also bought the 3 large mounted cabinets with these and those were no problem at all.